This event is for empowering young women and sharing the Oriflame earning opportunity with the youth. For further info just get in touch with me on 9820850522. You must attended this event. You will learn from experts how to make money in Oriflame business by working from home. I am doing a online business. 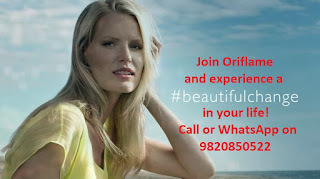 I get calls from customers in Bangalore, Chennai, Delhi, Hyderabad, Pune and Mumbai to buy Oriflame products online. I will share their experience and knowledge and help you grow. If you are not yet a member in Oriflame, we will help you with the registration process in Oriflame. Note: Prior registration is compulsory so please book your seats in advance otherwise you will not get an entry. You can also buy Oriflame products from me. I have many regular Oriflame customers. I can recommend products as per your skin type. People trust Jashmi as she is a certified beauty consultant of Oriflame.